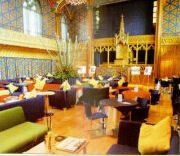 Here we have a list of the facinating things to see and do while visiting Edinburgh's Royal Mile. This information has been pieced together by Edinburgh Sherwood Guest House in a blatent attempt to attract those who will pay a visit to Edinburgh's Royal Mile, to stay at our extremely comfortable Edinburgh Guest House. Enough of the plug and on with the info. Price Adults 8.50gbp Children ( 5 - 15 ) 2gbp Seniors 6.5gbp. 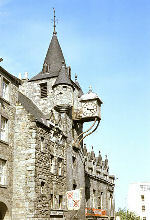 Mary King's Close is a range of closes and spaces that lie hidden beneath Edinburgh's City Chambers. This is a historically accurate interpretation of life in the city from the 16th - 19th century. 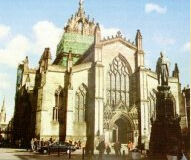 The Tron Kirk stands at the junction of North Bridge and The Royal Mile. 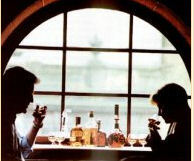 It has been witness to many a Hogmany celebration as the traditional gathering place of Edinburgh folk at New Year. The Edinburgh Street party is now much more popular. the Tron Kirk gets its name from the salt-tron, a public weighing beam which used to be located outside the church. It is now a visitors centre where ongoing excavations are taking place. As we move from the upper High St. to the lower High St. we cross over the junction of the North & South Bridge, locally known as the Bridges. The North Bridge ( closest to Princes St. ) opened in 1772, was widened in 1876 and reconstructed in 1877. It is the most outstanding of the city's viaducts and spans the ravine between the New Town and Old Town. After the completion of North Bridge the next stage in the great series of civic improvements which transformed the city during the late eighteenth century was the construction of South Bridge across the ravine of the Cowgate. 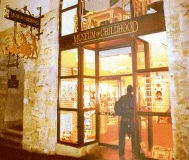 Beneath the 19 arches lie a set of underground passageways and chambers. Once used as workshops, houses and storage, these atmospheric, candlelit areas contain wine cellars, carved stones and soaring arches.Part of this area was devistated by fire and we await "the cooncil's" choice of what will replace the buildings leading from the cowgate to the surface & above of the South Bridge. Another wee snippet of interest ( at least it interested me ) is about The Royal Mile Tavern just opposit the Museum of Childhood. 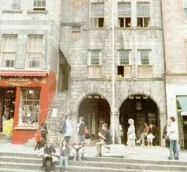 It was built on this site in the early 1800s following a fire which destroyed the original tenement block. "Heave awa' lads, am no deid yet!" Following more digging a young boy by the name of Jamie McGregor was pulled free of the rubble. 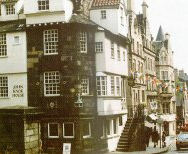 As we cross over the junction with St. Mary St./Jeffery St. the High Street becomes the Canongate in the second last street of the Royal Mile. As the name suggests this was where the tolls were paid to enter into Edinburgh. 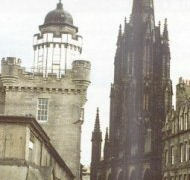 The tower is still there as is the nice wee pub underneath. See life as it was lived by the majority ofEdinburgh's citizens in the not too distant past. This exhibit is free and a great prod to the memory of some older folk and a revelation to our machine driven kids of today. 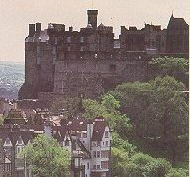 The story of Edinburgh from its pre-historic befinnings up to present day. A very informative visit.